Meditation helps you see the world clearly. It can be a muddy world out there with all the different messages floating towards you from society, family, government, and your own crazy mind. But when you meditate, all of that peripheral stuff drops off. Everything becomes clearer. Life becomes less muddy. Your path is lit up showing you the way. When I decided to quit my job to start my business, I did it because I had been consistently meditating for the year before that point, and I couldn’t hide from the truth anymore. The truth being, I was unhappy serving and building other people’s dreams and I wanted to start something of my own based on my dreams and vision. At that point, I didn’t realize how much my meditation practice would help me in my entrepreneurial journey as well. To be perfectly honest, an entrepreneur’s life is hard and not for everyone. It’s full of ups and downs, emotionally, physically, and spiritually. There are so many pitfalls, and blackholes to deal with. Some days you are excited to be alive and working on your dreams. Other days you feel so foolish for giving up a comfortable corporate existence to start your own thing. It requires a different breed of human to deal with the atrocities put upon by this entrepreneurial life. But something that helps quite a bit on the journey is holding a steady, consistent meditation practice. 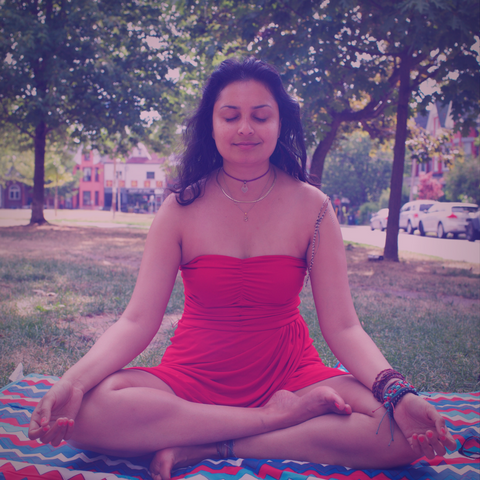 I want to share with you five reasons why I think my meditation practice is absolutely crucial for me as an entrepreneur. It is definitely not an exhaustive list and you might have other reasons why meditation helps you. The point is that it helps and we all need to build it into our routines no matter how busy we are. Entrepreneurship is filled with so many mood swings, that you might feel like you are becoming schizophrenic. One day you are dealing with the tidal wave of excitement and joy and the next with the pit of misery and depression. These mood swings can last for days at a time. They can also take over your body and mind, so you don’t actually get any real work done in those days. This means, you gain and lose momentum as these mood swings interrupt your flow. Meditation helps calm the mood swings, so that the peaks and valleys are not as apparent. I’m not saying that you will never feel these emotions again. We are still human even though we meditate. But the transitions through these tough times will be easier, and smoother. Like I said, your swings won’t be as deep and they won’t last as long. You might get into the the pit of depression just a little bit, be able to pull yourself out again and be on your merry way in a few hours. Before meditation, these episodes might have lasted days, even weeks. As humans in this distraction-filled world, we spend a lot of our time on the unnecessary. We waste our time on items that we pretend will be useful to us, but truly are not. This means that instead of working on the few items that will give us the most benefit in our business, we spend most of our time on useless drivel. This causes us to be not as successful as we’d like, and results in us losing our faith in our chosen path. Meditation helps clarify things in a way like never before. You are able to see exactly what is necessary and do only that. If you end up spending time on stuff that is unnecessary, you know you are doing it because you are procrastinating and it will not lead to any actual result for your business. This kind of clear thinking and knowing changes lives and businesses. Starting your own business means that the stress level in your life will probably go up exponentially. You are the only one taking care of everything now. You have no back-up. If you have a family to feed, that increases the pressure on you. If you let this stress accumulate, it is going to debilitate you in the end. Not only that, but it will probably end up causing some health issues as well. Meditation helps you deal with stress, so it rolls off your back like water off a duck. You are able to look at stress as an impartial observer from a distance. These items are supposed to cause you stress, but you feel weirdly calm about it. You know that feeling stressed about these items will not necessary make you feel better about it. In fact, it will probably detract from your problem solving, thinking brain. Running a business requires to you to be on, creatively, all the time. You are not a artist in the traditional sense, but you are constantly coming up with creative ways to deal with your business and its issues. But creativity like everything else comes to us in a limited supply. You start off the day with some, and then by the afternoon, you are probably running low. Meditation helps you recharge your creativity. In the middle of the day, when I am feeling tired, and like I need a recharge, I usually do a quick ten minute meditation session. I always end up feeling like I’m recharged and ready to go again. I produce a lot of content and this ensures that I don’t leave any part of my day wasted. Entrepreneurs spend a lot of time criticizing and judging themselves. It’s just who we are. We are Type-A perfectionists. Instead of being loving towards ourselves, and cutting ourselves slack, we push ourselves beyond the point of breaking. It’s just how we roll. It’s so unhealthy. Meditation cuts down the judgement in our minds. We realize everyone is doing the best they can in the moment. There is no point judging anything because everything is as it is. Nothing is good or bad. No choice we make is good or bad. No work we do is good or bad. We end up loving ourselves and the journey more, rather than hating every moment of it. Meditate as soon as you wake up – This ensures you will do it and get it over with. Some people meditate before they go to sleep. That works as well. I sit up in bed as soon as I’m awake, and do a 30 minute session. Boom, and done. Meditate for five minutes if you don’t have time – The consistency of the practice over a long period of time matters. Not how you do it, or how long you do it (time-wise). Sit for five minutes if that’s all you have. Stand in the shower and meditate. Sit at the red light and take that minute to meditate. Short and sweet. Meditate with what you got, where you are at – You don’t need fancy equipment to meditate. You don’t need a mantra or any kind. You don’t need to start worrying about where your head’s at. All we have to do is do the practice. Meditate with family members – Bringing meditation to your family members will change everyone’s life in such a profound way. You can grow together if you meditate together. Just do it. I hope this post helps you in your journey. If you are interested in getting more guidance, don’t forget to join my free private FB group at http://www.WhatsYourFreedomNumber.com.